You might remember my complete confusion after reading Daredevil Noir #3. In my review then, I hoped for a satisfying ending that tied everything together. With this issue, that’s what we got. 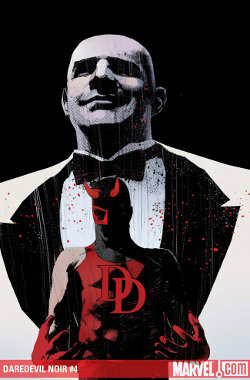 My feeling is that this whole story will read even better in trade, due to the way the story goes back and forth between two different points in time – the conversation between Daredevil and the Kingpin that frames the story, and the sequence of events that lead them there. Reading it all in one sitting will lessen the slightly jolting experience of doing so in short installments over three months. The strength of this particular issue, aside from the art (do we really need to mention the art again? ), is that it focuses so much on character. Despite a really tantalizing fight scene involving sharp silverware and a dive through a window, it’s Matt’s internal monologue and his conversations with Foggy and the Kingpin that really stay with me. Alex Irvine really gets Matt’s character, and he takes us on an interesting personal journey for Matt, as he is robbed of both his arrogant belief in his own infallibility and what little remains of his innocence. The ending will probably seem sudden to most readers, but it fits the story and the premise of Daredevil’s character perfectly, as well as being emblematic of his relationship with the Kingpin. I could absolutely see Alex Irvine writing a longer arc of the main book. For anyone who hasn’t followed this mini-series in singles, I absolutely recommend picking up the trade. One might argue that the “noir” version of Daredevil isn’t that different from the character we know from the main title, but that’s not necessarily a bad thing. This is just a good Daredevil story, plain and simple.